STAR INSIGHT – melodic/symphonic metal from Finland! STAR INSIGHT is a Finnish melodic/symphonic metal band which was founded in Seinäjoki back in 2005, but is now located in Lapua. 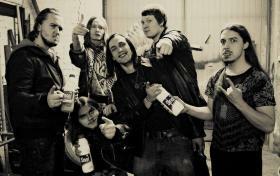 After four self-released records the band inked a deal with Finnish record label Inverse Records. Their debut album “Messera” will be released worldwide in August 1st 2014. In their music they mixed a lot of different elements. In addition to symphonic parts, you can also hear industrial sounds, punk riffs, ambient and also some power metallic drum pedalling. Vocals are traditional roaring which are filled in with clean vocals. The lyrics are primarily fictional and the theme is everything between heaven and earth.The songs for the album are carefully selected from broadest possible musical scale. This close half-hour package contains a lot of different songs and moods.